Now this is odd. 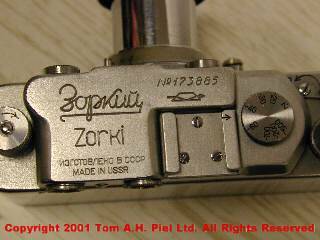 It's a Zorki 1b or 1c from 1951. But Silver lookalike. It lacks the vulcanite or leatherette layer. I was very suprised when I saw this. The book from Princelle (The Authentic Guide to Russian and Soviet cameras) does not mention a variation like this. So we must assume that this is NOT original. UPDATE Februari 10th 2002. 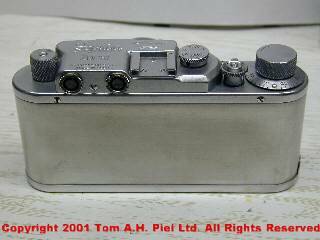 I've seen another Silver Zorki, same type, fully identical. Where there is two.... there could be more around. But why make a Zorki 1 like this? And how did it end up in Holland? Note that the engravings are both in Cyrillic and in Latin. Quite normal for the 1b and 1c types. Closer observation reveals that this is engraved not stamped. This places the camera before 1955. 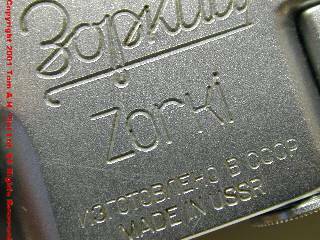 The Zorki 1d and 1e had stamped topplates. No decorative rim. 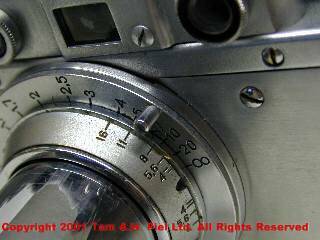 This places the camera before 1953 when the rim was added to the Zorki 1c. 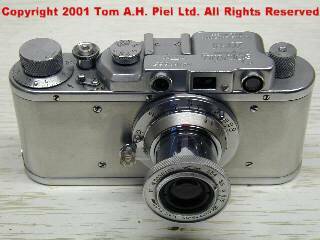 This means that according to Princelle this is a 1b camera. Or it's a c topplate with a b body. 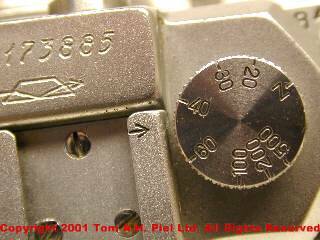 The placement of the serial number and the KMZ logo points at a Zorki 1c. Lens is clean, shuttercloth seems to be okay. All speeds work. But no indication whatsoever of being a special edition or anything else. No additonal engravings, no silk screening. But it looks great.